Our friend Alan Bardsley keeps the North Shore Community updated on the status of development and trail on Cypress. Here is an update from him! Public consultation on West Vancouver’s Trail Plan is underway in May. Interested riders are encouraged to attend the Information Session on May 10, 3:30 – 7 pm at the West Van Community Centre. Details are on the Trails Plan page. It includes important proposed draft recommendations that will form the policy framework for managing trails by West Van. Even if you attend, please complete the online survey before the end of May. It’s not clear if this will apply to trails in the future Cypress Village area, but it is likely to apply to other trails such as Mystery DH, Meat Sweats and Jersey Shore. There are two subjects worth special attention. First is the lack of authorized trails for mountain biking. Many would expect this to be covered under evolving trail usage. It’s not. Look in the section on environmental impact and you’ll find a recommendation to facilitate trails for all uses. It’s not obvious, but it’s there. The second subject primarily applies to hiking trails now, but could apply to bike trails later. 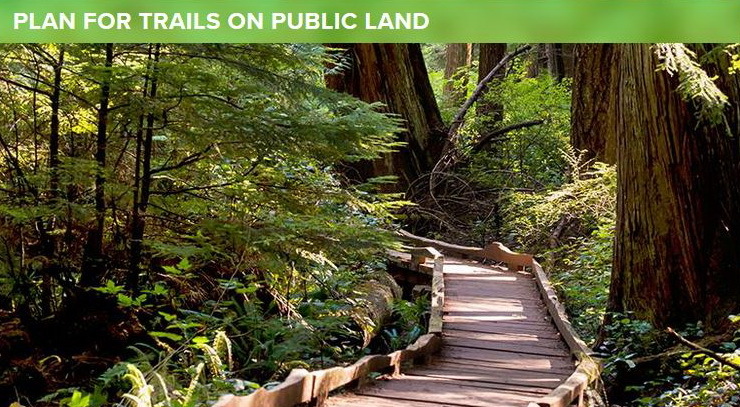 It is securing access to public trails on private land. Whistler has used Rights of Way to secure access to the Valley Trail where it crosses private land. West Vancouver has kilometres of trails on private land, such as Millstream, Brewis and Ballantree, but no agreements to secure access. Recently the property owner at Ballantree Park installed no trespassing signs. To avoid situations like this, consider supporting the draft recommendation to work with land owners to formalize public access. Whether it’s done through Rights of Way or License to Occupy, public access to trails should be secured. Please take the online survey and support the draft recommendations that are most important to you.